When industrial designer and engineer Daniel Norée launched the OpenRC project back in 2012 the intent was to show how useful 3D printing technology could be to RC hobbyists. His first open sourced RC car was the OpenRC Touring Car, a simple bare-bones hybrid 3D printed and metal component RC car that was quickly followed up by the almost completely 3D printable OpenRC Truggy. As Norée learned more about 3D printing and 3D design he’s tried to make each successive iteration of his RC project cars easier to build and make while eliminating as many non-3D printed parts as possible. OpenRC F1 3D printable parts. The latest OpenRC project is probably its easiest to build and assemble yet, and Norée is debuting it first on 3D model marketplace Pinshape. 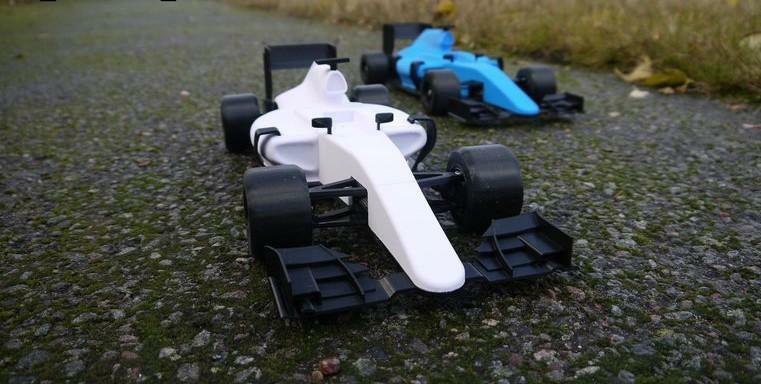 The OpenRC F1 Car is his most streamlined and simple RC car project to date and contains almost entirely 3D printable parts and simple, easy to install electronics. It is also Norée’s lightest designs, weighing in at only 500 grams before the electronics are installed, and used only half a spool of standard filament. Norée believes that the F1 is the most accessible OpenRC project for 3D printing enthusiasts. “I wanted to create something for everyone that’s less challenging to print and build. I learned a lot from the Truggy that even though I´d like to think I met my goals on that project, not everyone could finish building their own because of the complexity and precision needed for some of the parts. This time around, I used common PLA as the primary material instead of polycarbonate, and I made the parts more reasonably sized and easier to print,” Norée explained. With the exception of a small amount of flexible TPE for the F1 tires, the entire body was designed and optimized so it could be printed entirely in PLA–although Norée was quick to point out that the F1 can be printed out in any material if any users are looking for an even more durable final product. The body was designed to also be used as a display piece so the electronics don’t need to be added if the user doesn’t want to. Norée designed all of the parts to fit the build envelope on virtually any standard desktop 3D printers. The only non-3D printable components are the internal electronics, a few nuts, bolts and ball bearings. This was Norée’s most challenging design process for any of his OpenRC projects, but not specifically because of the design, he also needed to learn to use new design software. Having already designed most of the car Norée was approached by Autodesk and asked if he could design the F1 car in Autodesk Fusion 360 and then give a speech in Sweden on his design process. Norée was up for the challenge, but unfortunately he only had five weeks to finish the project and give his presentation, all while learning a brand new design program. “It might sound like 5 weeks is a lot of time, but this was done during the busiest time of the year at work and after time spent with the family, putting the kids to sleep etc. That’s when I had a moment to myself to focus on the project. So I put many late nights and way too much coffee into this project. On top of that I had to learn Fusion 360 from scratch. I had previously done some work on the design in my previous software, but I decided to redesign and remodel every single part in Fusion 360 to take advantage of the new tools at hand in the new software,” Norée said. Norée chose to release the OpenRC F1 project exclusively on Pinshape.com where all of the files can be downloaded for free, in addition to all of the previous OpenRc projects. Pinshape is a global 3D printable model marketplace that offers free and low-cost 3D printing projects ranging from home decor, toys, gadgets and jewelry. “We think we have a good platform with a lot of high quality, user generated content, and the OpenRC F1 car is no exception. Pinshape.com was built to foster the open­source, collaborative nature of the 3D printing community and we try to encourage collaboration and remixing with our contests, like the recent MakerTron design challenge. We’re pumped Daniel chose Pinshape to launch his designs because we’re a huge fans of his work. We featured him as our Designer of the Month back in August and we can’t wait to see what the Pinshape community does with these awesome designs,” said Pinshape CEO Lucas Matheson. Almost four years after Norée launched his first 3D printable RC car design the OpenRC Project has nearly five thousand members, and users from all over the world designing their own version of his designs. There are even designers creating custom designed parts and components for the OpenRc cars and a companion project called OpenRailway. You can find out more about the OpenRc project on their website, Norée’s personal website, the OpenRc google+ group and you can download all of the OpenRC cars directly from Pinshape. Discuss this story in the OpenRC F1 forum thread on 3DPB.com.